The Allamanda schottii, also called Bush Allamanda, is a compact broadleaf evergreen shrub that is hardy to plant in USDA growing zones 10 and 11. The plant is native to South America and reaches a height and spread of three feet. Allamanda schottii produces yellow trumpet-shaped flowers and tropical foliage. The shrub is propagated to create new plants by taking softwood cuttings in late spring from current year growth that is starting to become firm and mature. Cut 6-inch softwood stem cuttings from the Allamanda schottii shrub with a sharp knife. Choose stem sections from the top portion of the shrub that are beginning to harden and snap easily when broken. Cut off all leaves from the bottom one-third of the Allamanda schottii stem section. Cut large leaves on the top portion of the stem in half to preserve moisture and space in the rooting tray. Fill a rooting tray with sterile rooting medium that has been moistened with water. Rooting medium can be purchased at garden supply stores. Pour a small amount of powered rooting hormone on a piece of waxed paper. Dip the cut end of the Allamanda schottii stem into the hormone and lightly tap the stem to remove excess powder. Stick the stem into the rooting tray to a dept of 2 to 3 inches. Mist the Allamanda schottii cuttings and rooting medium with water and cover the container with a clear plastic bag that is closed and secured with a rubber band. This will increase the humidity around the cuttings during the rooting process. Place the rooting tray in a warm location that has indirect sunlight. The tray can also be placed on top of a germination heat mat under fluorescent light. Open the plastic bag 2 to 3 times a week to refresh the air around the cuttings. Monitor the rooting medium moisture to prevent the stems from drying. Pull on the Allamanda schottii cuttings after four weeks of growth to see if there is resistance from root growth. 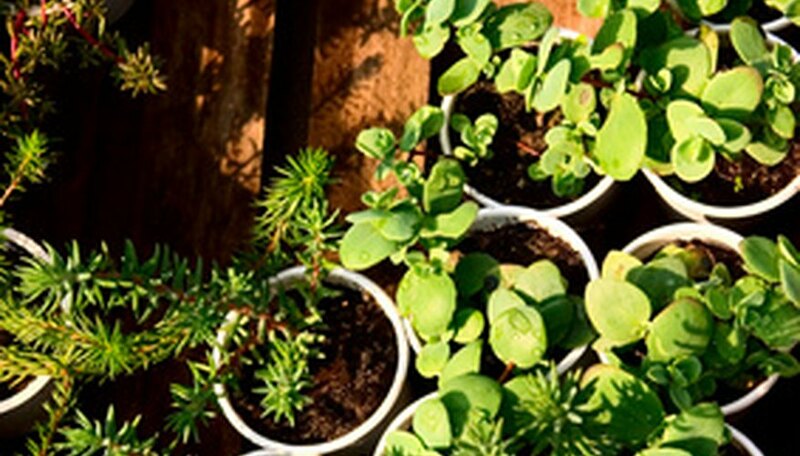 Transplant the cuttings to individual growing containers once the roots are at least 1 inch in length. Wash cutting tools in a solution of nine parts water and one part bleach to prevent the spread of disease.